Dagsboro Delaware Real Estate for sale - Delaware Beach Real Estate. Displayed below is an index of available Dagsboro Real Estate Properties currently offered for sale. 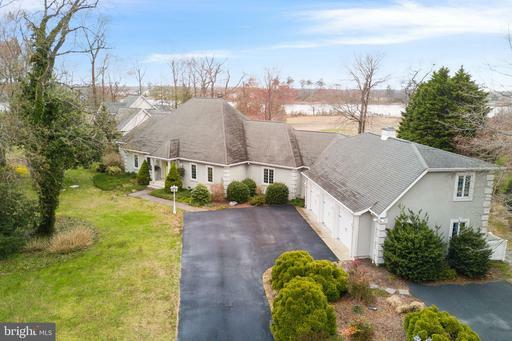 Click on the property photo or the address for each individual Dagsboro Delaware property full details, satellite map of the location and all amenities. For a more detailed & refined search of all Dagsboro Real Estate Properties on the Multiple Listing Service (MLS) consider using the detailed search page located here: "Detailed Real Estate Properties search." Picturesque sunsets and direct water views await from this newly renovated home with exceptional upgrades. Delight in one-level living while the accommodating guest quarters exists on the second level. Water views from every room, screened porch, open concept living area, soaring ceilings and so much more! Completion of home estimated November 2018. Community amenities include Marina, Pool, Tennis and Club Facility. 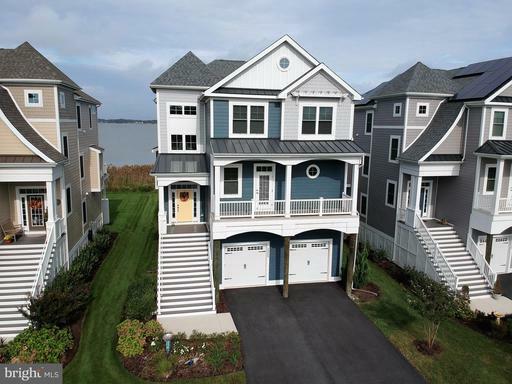 Extraordinary Bayfront home constructed with the finest finishes and unmatched wide open bay views from multiple decks plus spectacular vistas of the native marsh and wetlands from a number of balconies. Every room in this magnificent property has a view! This energy efficient home offers an elevator, impressive hardwood flooring and a dream gourmet kitchen with granite countertops, upgraded cabinetry, stainless appliances, tiled backsplash, gas cooktop, and double wall oven. 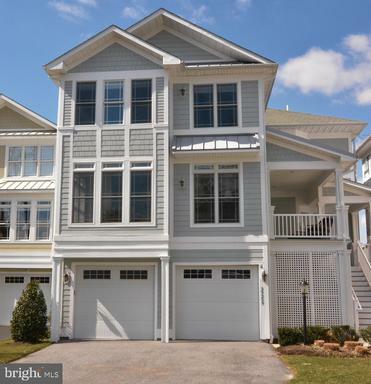 Featuring a desirable and spacious open floorplan with a stunning great room that opens to an expansive waterfront deck, additional living room or rec room on the first level opening to another waterfront porch, master suite with private bayfront deck and second master bedroom plus 2 guest bedrooms. Offered with designer furnishings, this turn-key home is better than brand new ! Situated just 7 miles to the beach in a quiet community offering pool, tennis, and fitness center, this is the perfect location to be close to the beach yet away from the crowds. PRIME LOCATION on Southwest side of Dupont Boulevard aka Rt 113. 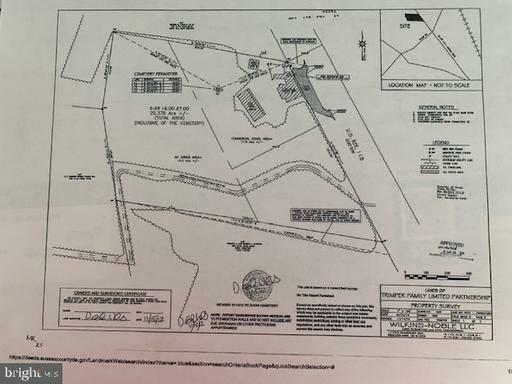 Site size is 22.38 acres consisting of 11.8 acres zoned Commercially- C-1 commercial District & 10.8 acres zoned Agriculturally- AR_1 Agricultural Residential District. Currently 3 structures on site no value given to structures. Currently improved with a warehouse and outbuildings with $3,500 a month in rents no lease. No consideration is given to improvements as best and highest use is commercial redevelopment. 61.66 Acres with Water access, Wetland views and Nature all around. Great potential for development with 2 boat ramps and direct water access to Pepper Creek and Indian River Bay. Only 8 miles to Bethany Beaches and the Atlantic Ocean. Public water hook up available. Price includes two parcels on both sides of Sussex Road. The land is a mixture of cleared, wooded and wetland. Exquisite home situated on 8 acres in mature wooded area. Immaculate and spacious, offering open floor concept, hardwood floors, 2 gas fireplaces, granite countertops, cathedral ceilings in foyer. Automatic Generator for power outage. Call now to schedule a tour of this gorgeous home!!! Looking for a golf course and bay views? Look no further... Offering 5 bedrooms, 4.5 baths, 2 car garage, and a full basement. The entry level suite provides 1st floor living with a formal dining area, den/office, open kitchen and great room with breathtaking views of the 3rd fairway and Indian River Bay. The gourmet kitchen offers granite counter tops, SS appliances, eat-in area, custom cabinetry, double oven, and island with seating. The screened porch doubles as a open patio with awesome views. The 2nd floor offers 2 additional suites with deck views of the golf course and bay. The bonus room offers additional living space. The basement showcases the quality construction ready for you to finish off to your liken. Schedule your property showing today and you will not regret what this property has to offer. Prime waterfront property and premier almost 5,000-sq. 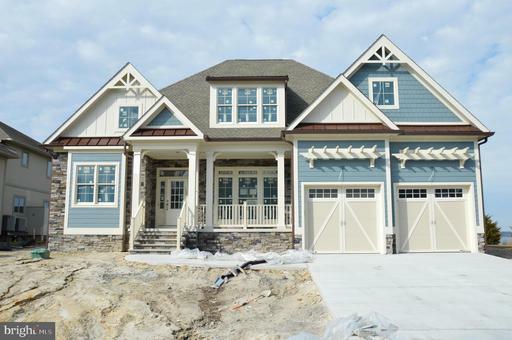 ft. estate on Pepper Creek in Point Farm! Relish 3BRs/2full baths/2PR plus gracious extra 2-room/1 full bath suite in this French Provincial home with contemporary, open floor plan that has it all! 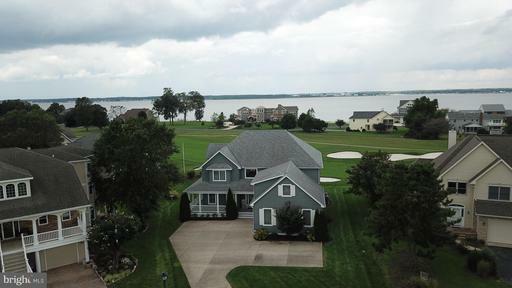 Almost 1-acre, corner landscaped lot touts private dock, swimming pool/diving board, gazebo, 2-tier deck and more plus 8 miles to Bethany Beach! A stay-cation, luxury home to enjoy every day. In 2004 note upgrades galore! New 15 x 30 sunroom, breakfast room, PR, oversized 3-car garage with guest suite above, renovated kitchen, 21 x 46 heated inground pool, enlarged laundry room 16-ft octagon screened gazebo, pool storage room, outside shower/dressing room, and more! Columned covered front porch with custom dual-door entrance with transom leads to wide ceramic tile floor foyer featuring Waterford chandelier and uninterrupted spectacular water views. 2 stately columns mark entrance to sunken LR where crown molding, gorgeous 3~ & 4~ variegated pecan hardwood floors, wall of custom built-ins, and gas FP with black marble surround encapsulate elegance. French doors, flanked by stationary French door panels, grant access to sun-infused sunroom beyond. Textures of ceramic tile floor with decorative inset and floor-to-ceiling stone FP meld together with dimensions of crown molding with extended ledge and tray ceiling to create architectural masterpiece in this retreat space with up-front water views through wall of triple pane windows with interior shades. Opposite LR is intimate DR showcasing 15-ft custom design cabinetry with quartz counter serving area and tile floored PR with sleek black sink, while adjacent to LR is slightly elevated 5-window bump-out breakfast nook with nice niche of window seat/storage. New ceramic tile kitchen is all-encompassing and on-trend! Handsome cabinets, SS appliances (incl. 2 full-size ovens/confection), 2-tier granite countertops/breakfast bar with 4-plus seating and tumble marble backsplash with ceramic glass deco tiles raises the bar on beauty. Plus, full wall of 2 floor-to-ceiling cabinets flanking window seat, and 2 closets. Corner bonus wet bar with beverage refrigerator, built-in refrigerator and wine rack, and ice machine puts instant entertaining at your fingertips! Added footage of mud room, pocket-door laundry room, pantry, PR and closet provide extra space, storage and savvy! From mud room ~ glass pane door leads up to extra 2nd floor 2nd-suite with 2 separate rooms, separate balcony with underneath storage barn, separate outside entrance and own ceramic tile full bath! Private, practical and perfect for teen, in-law or drop-in guest! Opposite wing of home is hardwood-floored first-class 1st-floor MBR! Enjoy generous sitting area along with 2 walk-in closets. Appreciate decadent details of crown molding, millwork around doorways and window seat with water views, where one can relax and be lulled by bay~s rhythmic motion. Lavish bath has sunken 7-ft. whirlpool tub overlooking pool and creek, 6-ft. 2-sink maple vanity with Corian counters, 2-headed all-tile shower, and block lead-glass ~ accent walls! 2nd main-house level has walk-up completely floored attic and walk-in cedar closet. 2 additional BRs overlook water and are mirror images of each other with tan carpeting, DD closet, crown molding, and ceiling fans with full bath nestled in between. Perfect perks are 4-zone heating, Rennai hot water heater, and central vac/irrigation systems. Resort-style back yard and beyond! Relish boat ride ~ mile to Indian River Inlet, catch fresh crabs from private dock, take a dip in heated pool, sun on stamped concrete pool decking, soak in hot tub, admire babbling creek and rock-stacked waterfall/garden, wine and dine on outdoor deck, and unwind in screened-in gazebo watching sunset over water. Enjoy life to its fullest at 120 Creekside Drive!